As the week comes to a close and the weekend is about to start, I like to stop for a moment to appreciate the small things. We tend to overlook the small daily happenings and focus on the larger ones. We focus on the bills that need to be paid (rightfully so! ), dinner that needs to be made, cat-hair tumbleweeds that need to be vacuumed. But it's the small things that really make our life enjoyable. Today it is my Bubs little face. Yes, he's cute all the time, but when he is sleeping he exudes innocence. Most of the time when he sleeps I rush off to do household chores. Well, not right now. I'm soaking in this moment, knowing it will vanish all too quickly. Take a moment to relish in the moments we so often take for granted or overlook. O.M.G. 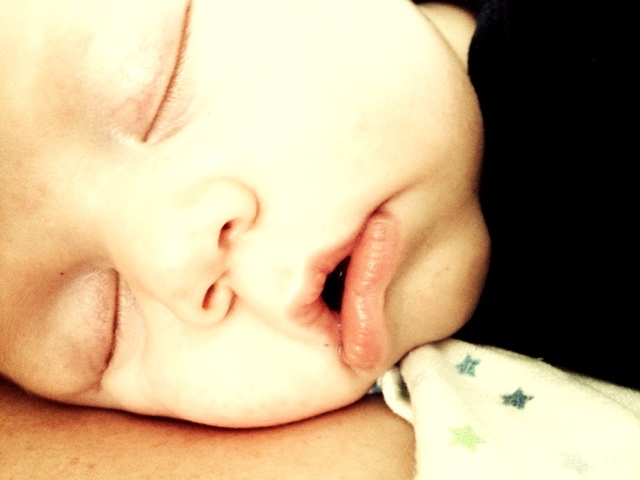 There are few things more sweet than a slack jawed baby with soft little baby lips and chubby cheeks! I couldn't agree more!! I have actually had to delete photos off of my phone because I take too many of him!